Mazda 3 Performance, Engine, Ride, Handling | What Car? Despite being a relatively hefty 2.0 litres in capacity, the Mazda 3's entry-level petrol engine delivers slower acceleration than the 1.0-litre engines of similarly priced rivals like the Ford Focus and Skoda Octavia. The reason? The Mazda's engine isn't turbocharged. The absence of a turbo also means you have to rev the engine hard to get the best from it. While the 1.0-litre Focus and Octavia will pull hard from below 2000rpm, the Mazda only really gets a move on beyond 4000rpm. 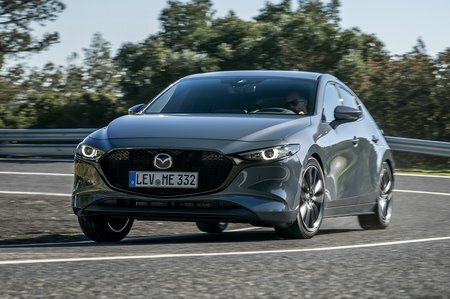 Mercifully it remains relatively smooth no matter how high it’s revved, but there’s little doubt that the Mazda will be harder work to drive day-to-day than the Ford or Skoda. That’s why, for the time being at least, we recommend the turbocharged 1.8-litre diesel. Its greater low down grunt helps it to accelerate relatively effortlessly in higher gears and – unusually for a diesel – it's also quite happy to rev freely to the redline. Our only criticism is that its throttle response is a little less immediate than that of rivals such as the Focus and Octavia. In truth, however, we reckon most buyers would be better off waiting for the new Skyactiv-X petrol engine that’s due later this year. 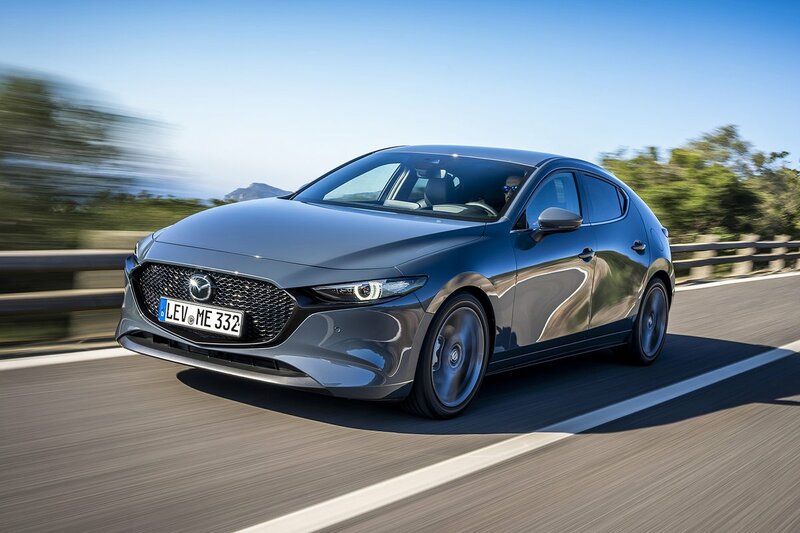 With 179bhp, compared to the relatively puny 120bhp of the 2.0-litre Skyactiv-G, it should provide much more willing performance without a significant fuel economy penalty. Ride comfort isn't one of the Mazda 3's strongest suits, so don't expect it to smother bumps as well as the VW Golf, Ford Focus or even a Skoda Octavia. That said, things never become bone-shakingly firm or uncomfortable – even along pockmarked urban backstreets. To lessen the impact of bumps, stick with 16in alloys (standard on SE and SE-L trims) rather than the 18in wheels and low-profile tyres that come on range-topping Sport models. If there’s one detail that Mazda’s engineers have mastered over the years, it’s that key controls such as the clutch, throttle and gear selector have a consistent weight to them. And before you go thinking that these characteristics only benefit ‘keen drivers’, that’s simply not the case. 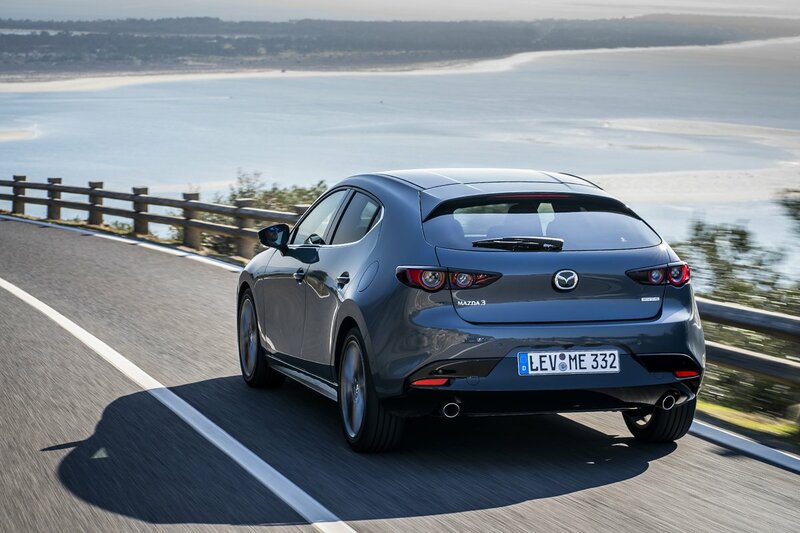 From the well weighted steering to its delightfully firm brake pedal, the Mazda 3 provides as much confidence as you could ask for, whether you’re trundling about town, tackling a winding road or cruising on a motorway. You’ll find similar reassurance in the way the 3 conducts itself on demanding country roads. There’s body lean, yes, but it’s controlled and progressive and, while the 3’s front end will eventually push wide when the limit of adhesion is reached, you can balance the car nicely by gently lifting off the accelerator. Mazda worked hard on ensuring that the 3 is of the quietest cars in its class, and all that effort has certainly paid off. Wind and road noise are really well suppressed even at motorway speeds, and there’s far less suspension noise than you’ll encounter in a Skoda Octavia. The entry-level petrol engine is quiet at a cruise and, even though it needs working harder than a turbocharged engine to make decent progress, remains fairly subdued at all speeds. The diesel, meanwhile, is far more vocal, but is still perfectly acceptable by class standards.